Wonderful MK, you are always preserving our church's tradition now and forever. Good to see begena to be used by many Christians. ማህበረ ቅዱሳን ወይም የቅዱሳን ማህበር: ማለት የማህበሩ አባላት ቅዱሳን የሆኑ ማለት ነው። መስራቾቹ እራሳቸውን ቅዱሳን አድርገው ከዚያም በላይ የቅዱሳኖች ሰብሳቢ አድርገው ማህበረ ቅዱሳንን መሰረቱ። አባላቶቹም ቅዱሳን ነን ብለው ከቤተ ክርስቲያን አባልነታቸው ይልቅ የማህበረ ቅዱሳ አባልነትን በማስበለጥ የማህበሩ አባላት ሆነው ሲከራከሩለት ይገኛሉ። ለመሆኑ በሐይማኖታችን አንድ ሰው ወይም አንድ ማህበር እራሱን ቅዱስ ማለት ይችላል? በክርስቶስ ደም ከተመሰረተችዋ ከቅድስት ቤተ ክርስቲያን በላይ ቅዱስ ተገኝቶ ነው? የሚወዳደራትስ ይገኝ ይሆን? ቤተ ክርስቲያን እኮ በክርስቶስ ደም የተመሰረተች የቅዱሳንና ቅዱሳን ሊሆኑ የተጠሩ ማህበር ናት? ሮሜ ፩፥፯። እና ታዲያ እነዚህ ከየት የመጡ፣ የተለዩ ቅዱሳኖች ናቸው እራሳቸውን ቅዱሳን ብለው የሰየሙት? የሐይማኖት አባቶችን ተሳዳቢዎች? ስለነሱ ሳስብ የያዕቆብ ወንድም የሐዋርያው የቅዱስ ይሁዳን መልእክት ያስታውሱኛል። መልእክቱ ከማህበሩ ምግባር ጋር አብሮ የሚሄድ ነው። ሰላም ለኪ … ሳይሉ ደርሰው አባቶችን ተቺና ተሳዳቢዎች፤ የክህነት መጀመሪያውን እንኳን ሳይዙ ከላይ ያሉትን አባቶች ሊዳኙ በልባቸው መደንደን የሚጓዙ ደፋሮች። መናፍቅ ማለት ምን ማለት መሆኑን ሳያውቁና ሳይረዱ ደርሰው ለመከሩዋቸው መናፍቅ የሚል ስም ለጣፊዎች። ለመሆኑ በምን ስልጣናቸው ይሆን ሌሎችን መናፍቅ ብለው የሚጠሩት? What about Mahibere Selassie, Mahibere Maryam, Mahibere Michael? Have you ever participate in any Tswa mahiber????? Anony, please correct your mistake or do not write before you know the meaning. dear Anon.. who is insulting Mk! Why not you take a minute to know why and how it is called Mahibere-Kidusan than insulting blindly? KemeTemTem memar yiqdem! I DO NOT KNOW ANY MAHBER AND I DON'T WANT TO KNOW ANY IN FUTURE EXCEPT MY TEWAHDO, ONE CHURCH, ONE MAHBER,UNDIVIDED,BUILT BY THE PURE BLOOD OF OUR LORD JESUS CHRIST. "After Jesus said this, he looked toward heaven and prayed:...Holy Father, protect them by the power of your name—the name you gave me—so that they may be one as we are one". A well documented reading about MK So, Know who you are and what you are doing good and bad. This will help you know what is wrong with MK and what is good about them. Have fun!!! a well documented reading about MK. So, Know who you are and what you are doing good and bad. This will help you know what is wrong with MK and what is good about them. Have fun!!! TIRFU GIN DIKAM ENA HATIYAT BICHA NEW! SANAWIKEW YESEYITAN MELIKITEGNOCH ENDANIHON ENITENKEK! For those who want to know the truth about Mahibere Kidusan, how it was established and what it is doing!!! For more comprehensive and detailed information about MAHIBERE KIDUSAN from inception up to the present visit this site. AGAIN, I DO NOT KNOW ANY MAHBER AND I DON'T WANT TO KNOW ANY IN FUTURE EXCEPT MY TEWAHDO, ONE CHURCH, ONE MAHBER,UNDIVIDED,BUILT BY THE PURE BLOOD OF OUR LORD JESUS CHRIST. HE MADE US ONE. Our church servived 1936 years without any MK and will survive untill her Groom comes again. Why now we need MK in 1970? Now MK comes by Saints name and our lady saint Mary's name and is a matter of time before they evolve to be the head of the church. ምነው ተሐድሶ መናፍቃን ስለ ማኅበረ ቅዱሳን እውነተኛ አገልግሎት ሲነሳ ይንጫጫሉ? 1. The current members of this organization may not even be aware of the history of this hideous organization, as they were not even born when the organization was first formed. It all began as opposition group of the late Abuna Tewoflos as “Atekalye Gubaye” for three primary reasons. 2) In order to forever curb the influence of menafekan and “Atekalye Gubaye”, the patriarch in acted the formation of “Sebeka Gubaye” allowing every member of the parish to participate in the daily activity of the church till this very day. 3) Unlike today’s state of the church “Teneshewa Mekele”, The Holy father was a staunch Ethiopian who vehemently opposed to ethnic preferences in order to serve the body of Christ which ran to the contrary of “Atekalye Gubaye” main goal. After its successful role in the assassination of the Holy Father, in 1981 the organization had a nerve to submit application to the Holy Synod to freely organize within the Church without any kind of accountibility. The Late Abuna TekleHaimanot sealed its fate by denying its request and later on its ultimate refugee in Zewaye region where it adopted the current infamous name “Mahebere Kidusan”. This coincided with the invasion of Woyane in 1991 who perfectly knew the history of the organization to successfully used it as a readymade tool to infiltrate the Church for its own agenda. 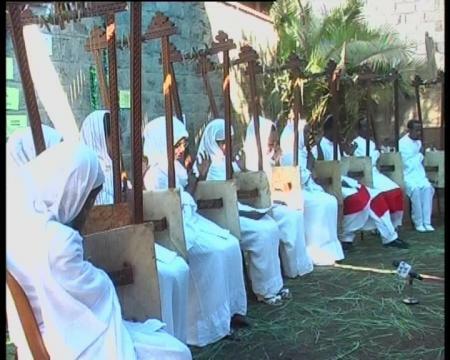 From that time forward “Mahebere Kidusan” was allowed to organize for the first time free from the church’s authority in every parish throughout Ethiopia except Tigray region. In 2001 the division within Woyane’s rank gave a new golden opportunity to “Mahebere Kidusan” when the surviving woyane entity (Melese’s flank) who moved to seek alliance with other nationalities as its lost a significant Tigray base. In this endeavor Aba Geberemedhene was quickly summoned to give a legal authority to “Mahebere Kidusan” to legalize its activity for the purpose of recruiting Woyane’s support as well as purge anyone who remain against woyane in the church. This 36 pages proclamation which was signed by 15 archbishops of Aba GebreMedhin on Ethiopian Calander Nehase 12/11/1994 (EC August 2002) with Synod doc # 187/275/94 gave “Mahebere Kidusan” unprecedented authority to destroy the Ethiopian Orthodox Church from within. Seeing and calling for what it is, there is a contract on Ethiopia and the Orthodox Tewahedo Church as this priceless institution which defines the country we know staggers to behold. As Abuna Gorgorios once defined it, ‘the church that gave Ethiopia its faith, its language with Fidel, its existence with freedom …….is unlike any other in the world’ Therefore, to all of us the church and the country is the two faces of the same coin. For anyone to argue to restrain from exposing the sinister contract to destroy the church (and their by dismembering the nation of Ethiopia) is simply asking all of us to standby within the limit of artificial boundary and surrender everything that define us. We seek no more telling observation than His Grace Abuna Gorgorios himself who at the end acknowledged the destructive nature of the organization by saying" ... Forgive me Lord for unleashing this bonfire onto your church..."
After decades unbelievable menace and profiteering, the inevitable has come to roost on themselves. The dragon net planted to enslave the Ethiopian people is turning its venomous fang against its master Aba Paulos himself. Maake (soot and ashes) the adoring nickname given to MK by the Ethiopian faithfuls has now suffered a mortal blow when it lost all its material holding to the church and exiled its pseudo patriarch Daniel Kibret who in his recent article compared Jesus Christ with Prophet Mohammed. http://deje-selam.blogspot.com/2009/03/blog-post_28.html. This is the sad end of Mahebere Kidusan, and glory to the divine God of Aba Tekelhaimanot who indeed did them. My heart goes out to those young members of “Mahebere Kidusan” who unknowingly are complicit with the most evil alien ever to occupy our nation. Christ the Lord has given all of us the passage of repentance to join the everlasting mercy of his kingdom, and we shall pray for that day to come upon them. Today however, I am more concerned with millions of faithful of the church and the people of Ethiopia to make sure the agent of nation-killers are not left without measure. ስለ ማኅበረ ቅዱሳን እውነተኛ አገልግሎ ሲነሳ ይንጫጫሉ? You don't want to know any Mahiber in the future but Tewahido? I doubt you stay on Tewahido too!!! My dear bro - stick to your original love, if you start denying it that will be the begining of the big fail. Find out the root cause, I feel you are trying to deny many truth. Just this is my feeling. I love you so much brother - your work is the ever icon of our church history. ማህበረ ቅዱሳኖች እራሳቸውን ቅዱሳኖች በማለት የሾሙ አይደሉም.